Voices of Civil Rights Lawyers with Armand Derfner at Blue Bicycle Books. 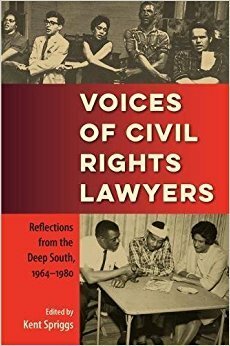 Voices of Civil Rights Lawyers offers eyewitness accounts of some of the most dramatic moments in civil rights history–the 1965 Selma March, the first civil judgment against the Ku Klux Klan, the creation of ballot access for African Americans in Alabama, and the 1968 Democratic Convention. The narratives depict attorney-client relationships extraordinary in their mutual trust and commitment to risk-taking. White and black, male and female, northern and southern, these recruits in the battle for freedom helped shape a critical chapter of American history. Join Blue Bicycle Books at 6 pm this Thursday as local lawyer Armand Derfner talks about his pivotal role in the American Civil Rights Movement. Beginning with his work representing disenfranchised voters in Greenwood, Mississippi, in 1968, Armand was among the first lawyers to argue cases involving the Voting Rights Act. Previous post IAAM CEO Profiled by The Undefeated.